Epiphone proudly presents the historic Ltd. Ed. Korina Flying-V in a Korina body with Alnico Classic™ Humbuckers, and gold hardware. The Flying-V electric guitar was first released in a very limited run in the late 50s and was one of the most radical designs of its time. Somehow, many of those rare originals wound up in the hands of rock’s greatest guitarists including Jimi Hendrix and Lonnie Mack along with Keith Richards and Brian Jones of the Rolling Stones. Today original Flying-Vs are some of the most expensive instruments on the vintage market. Embraced by classic rock and metal fans, the Flying-V is one of the most recognized electric guitars in the world (coming in second only to the Les Paul) and is one of the most popular designs in Gibson and Epiphone’s long history. Now, Epiphone introduces the legendary Flying-V to a new generation with an all Korina (also known as African Limba) body with modern hardware and superb vintage voiced Alnico Classic™ Humbuckers. The Ltd. Ed. 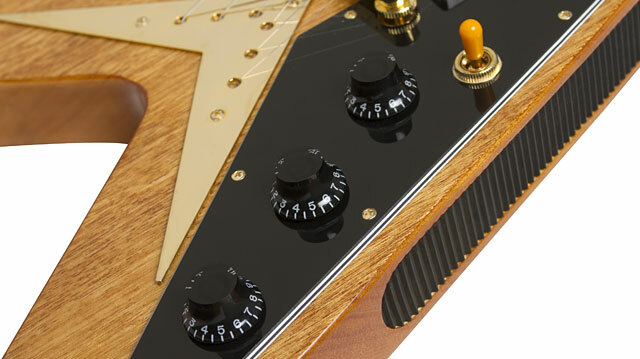 Korina Flying-V is made from Korina, one of the great tone woods for electric instruments. Korina was first used by Gibson in the late 50s for the first limited run of both the Flying V and the Explorer. Korina quickly drew the admiration of luthiers and guitarists for their warm tone and strong resonant properties. The new Ltd. Ed. 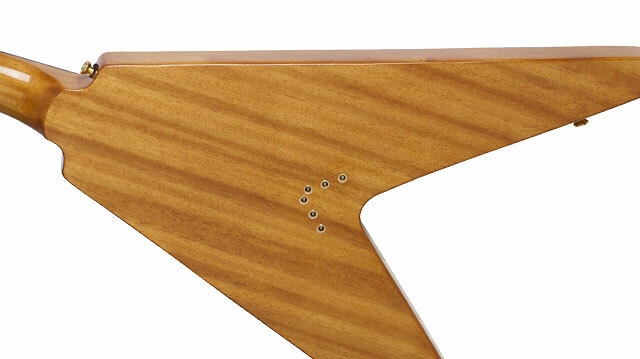 Korina Flying-V is finished in Antique Natural to show off the guitar’s fine and delicate grain. Korina wood is also lightweight, easy to hold, and comfortable to play. The neck has a classic "1960's" SlimTaper™ D-Profile and a 24.75” scale, perfect for any style. The fingerboard has a 12” radius, traditional pearloid "Dot" inlays, a 1 11/16” nut, and 22 medium jumbo frets. The Flying’s V’s trademark “V” headstock has a classic 60s era "Epiphone" script logo in pearloid along with Epiphone solid nickel premium die-cast "Deluxe" Tuners with Tulip buttons with a 18:1 tuning ratio for fast and reliable tuning. The Ltd. Ed. 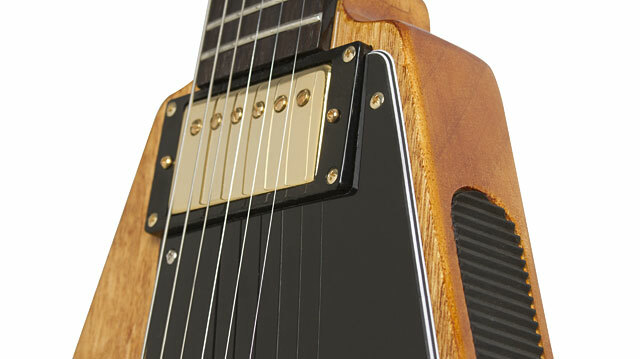 Korina Flying-V is powered by an Alnico ClassicTM in the neck position and an overwound, slightly hotter Alnico Classic PlusTM in the bridge position. Similar in tone to the “PAF-style” humbuckers found in rare vintage Flying Vs, Alnico Classics use Alnico-V magnets for a higher output with enhanced mids and highs. Alnico Classics are carefully wound to reveal the full tonal range of the Flying V’s Korina body for exceptional power and detail. Controls include individual volume controls for each pickup and a master tone, all with vintage-style Black “Top Hat” knobs. Epiphone hardware is guaranteed for the life and the Ltd. Ed. Korina Flying-V features a LockTone™ Tune-o-matic bridge and traditional Flying-V style String-Thru Body "V" metal plate along with an Epiphone all-metal non-rotating ¼” jack. All hardware, including the “Deluxe" machine heads, is gold (solid nickel), a perfect complement to the Antique Natural finish. The Epiphone Ltd. Ed. Korina Flying V comes with Epiphone’s Limited Lifetime Guarantee and Gibson’s world famous 24/7/365 expert Customer Service. 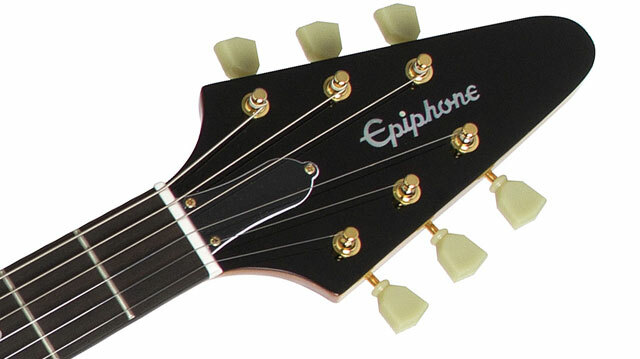 See your nearest Authorized Epiphone Dealer soon to discover the Epiphone Ltd. Ed. Korina Flying-V or visit Epiphone.com to find a dealer near you anywhere in the world.